Saturday, the Union Market District celebrated its diverse collection of businesses, both old and new, with a daylong street festival featuring food and activities from district neighbors and partners. Mayor Muriel Bowser joined artists, performers, business creatives, chefs and more to celebrate the best of the Union Market neighborhood. Trader Joe’s, Politics and Prose, Cotton & Reed, Masseria, Pluma by Bluebird Bakery, A. Litteri, Blue Bottle Coffee, DC United and more got in on the festivities, which kicked off with remarks by Edens CEO Jodie McLean, Deputy Mayor Brian Kenner, Councilmember Kenyan R. McDuffie and Chairman Phil Mendelson. Three student poets from DC Scores took the stage and captivated an audience of more than 80 attendees. Inside the Edison building, guests poked their heads inside an art installation by Dan Steinhilber to preview the upcoming By The People art festival happening this June, powered by Halcyon House. Meanwhile, a few blocks away on 4th Street NE, Nick Stefanelli of Masseria cranked out breakfast bites and welcomed a performance by local salsa group, Salsa with Silvia, in the heart of his Michelin-starred restaurant. More than 70 fitness fanatics made their way to Union Market’s Dock 5 for Yoga with Nya, a free 60-minute vinyasa yoga class led by local yoga guru Nya Alemayhu. Instagram influencers Tamon George and Gary Williams of Creative Theory took free portrait photos of market-goers in the historic alley of 4th x Neal, welcoming the Mayor into their space for a quick photoshoot with her longtime photog. She then headed over to Brief Assembly, owned by Mallory Shelter and Carolyn Misterek for a quick tour of the new retail space, which found a brick-and-mortar home at Union Market this past February following the success of the holiday pop-up. 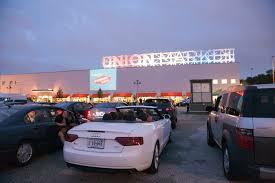 Union Market Drive-In Is Back!